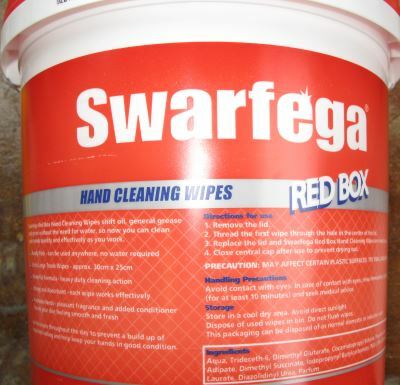 The Swarfega hand wipes. I’m used to Swarfega being a thick green jelly that you rub all over your hands and work it in to remove the grease and dirt and then lots of soapy water to remove. This box was on offer at Axminster and cost me roughly £10 – normal price is around £16. The quote is “will quickly remove household paints, adhesives, fillers, sealants and lacquers”. 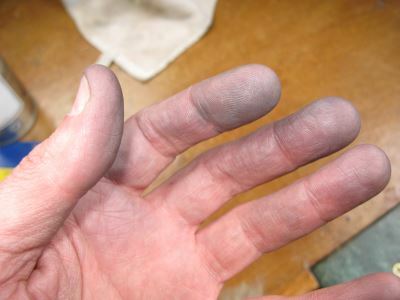 I have a bad habit of cleaning my hands in a recently cleaned sink and leaving greasy marks around taps, soak and even on the hand towel. Therefore, I thought that £10 for 150 of these they were worth a go. I will come back and update this report as I go. 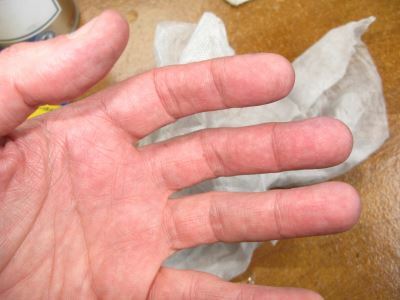 My hand before using the wipes. Only light dirt and mostly a fine metal based grime from using the milling machine with an oil based cutting fluid. I must admit that this fine metal and oil is one of the worst for getting off your skin and normally it takes a good amount of soap and water to remove. The smell of this fine metal stays with your hands for some time and again is difficult to get rid of on the first clean. The wipes are like strong kitchen towel soaked in a quite strong smelling liquid. 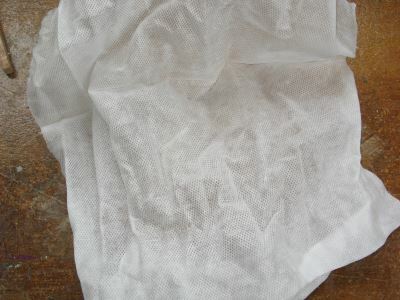 Each wipe is roughly 25cm x 30cm and so a good size to work on your hands. The description says they are “double sided”, but based on the fact they are like a strong paper towel impregnated with a cleaning fluid it would be difficult I think to make a single sided version. The wipes are on a continuous roll and there is a small opening in the lid so that they can be pulled from the centre of the roll. You will have to look out for the perforations and pull the paper towel from the roll. The small access lid and recess is quite restricted and so you will have to push the end of the next towel back in order to snap the lid back. Not a bad result, most of the oil, fine metal and abrasive has been removed from my hands. Now completely fine to go indoors and wash my hands with soap and water in a normal sink without creating a lot of other issues. As I said earlier I will update this article as I try the wipes on different types of grease, dirt, paint etc and as a function of time to see if they last or if they dry out and become unusable – we will see.